I AM NO FASHIONISTA or anything closely resembling a woman who knows, or really cares, about fashion. So when I stopped at the Mantorville Art Guild last week while visiting this historic southeastern Minnesota river town, I had no idea I had just stepped into the world of fashion. 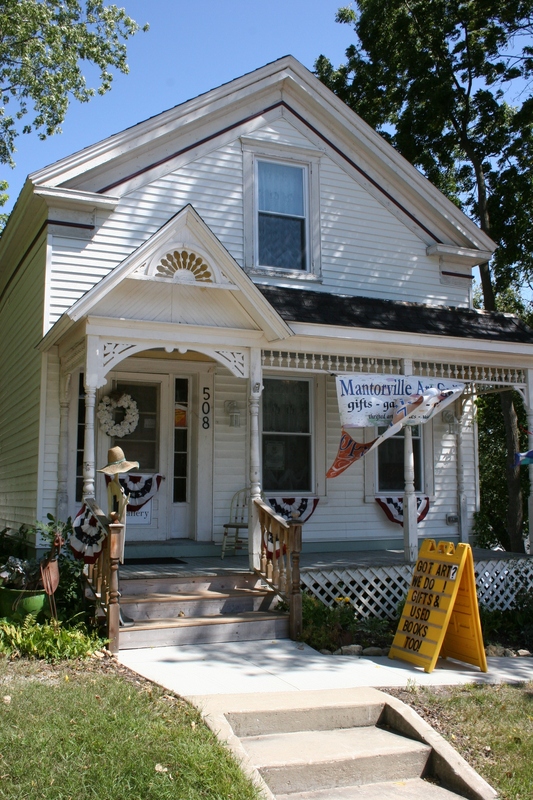 When you enter the Mantorville Art Guild, turn and pull hard on the door knob. And if a strong wind is blowing, hang onto the screen door. But I should have figured it out given the fashionably-dressed women consulting with artist Max Lohrbach. They weren’t, like me, dressed in plain denim shorts, a scoop-necked cotton shirt and $3 flip flops from Walmart. Rather, one wore an ankle-length shoulderless dress with a swatch of fabric crossing her back and a band tied at her neck. A big bag was fashionably slung over her shoulder. I can’t recall the other woman’s attire, but neither toted a bulky brown camera bag like me. I felt a bit under-dressed for the occasion. How was I to know, though, that one of Minnesota’s premier fashion designers would be there? That would be Lohrbach. Not until I returned home did I realize his importance. In the background, Max Lohrbach visits with guests at his "Souvenir Portrait" exhibit, which opened August 21 in Mantorville. My blissful ignorance allowed me to enjoy Lohrbach’s “Souvenir Portrait” without star-struck pretenses. I was simply viewing an artistic piece that, to me, seems a perfect fit for the artist’s hometown of Mantorville, a community with a 12-block downtown on the National Historic Registry. 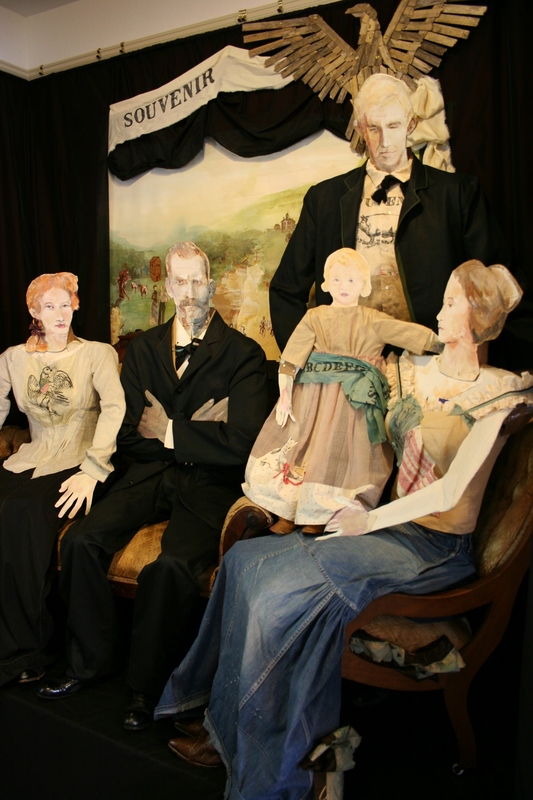 Lohrbach’s 2-3 dimensional “installed illustration” showcases his original garments influenced by, and depicting, the 1876 era, the time of our nation’s Centennial. 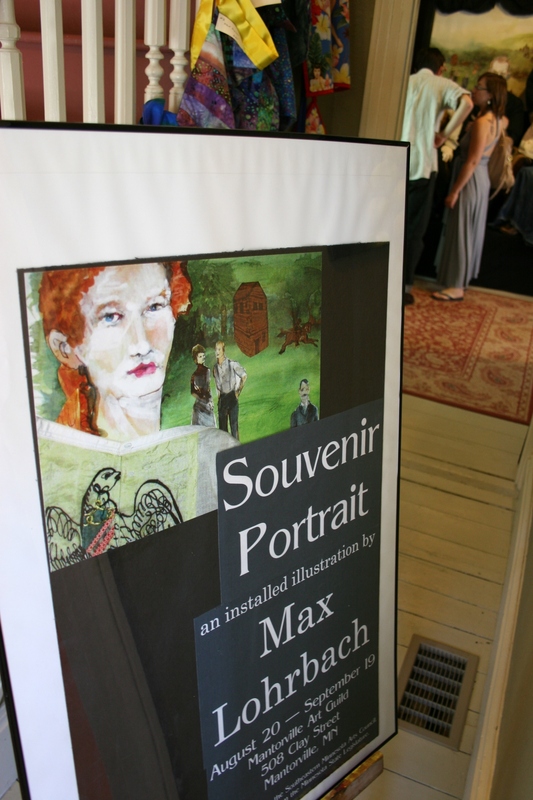 Max Lohrbach's "Souvenir Portrait" at the Mantorville Art Guild. 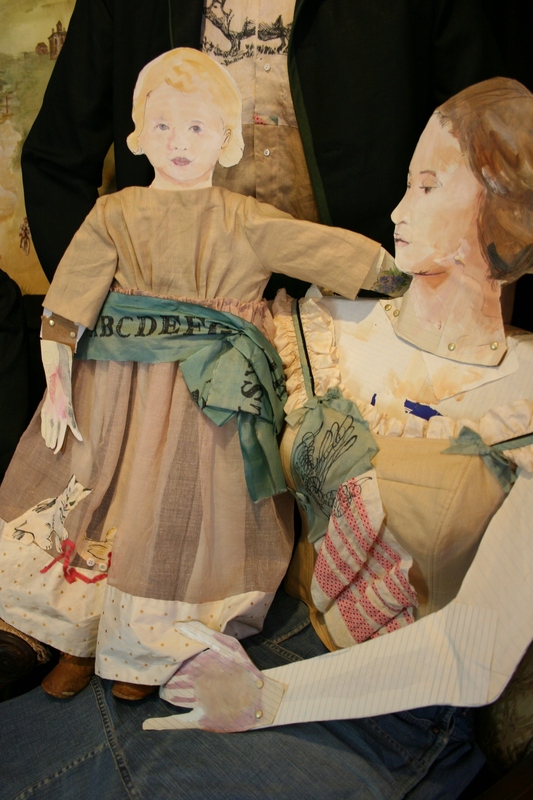 Lohrbach's work depicts the love between mother and child. 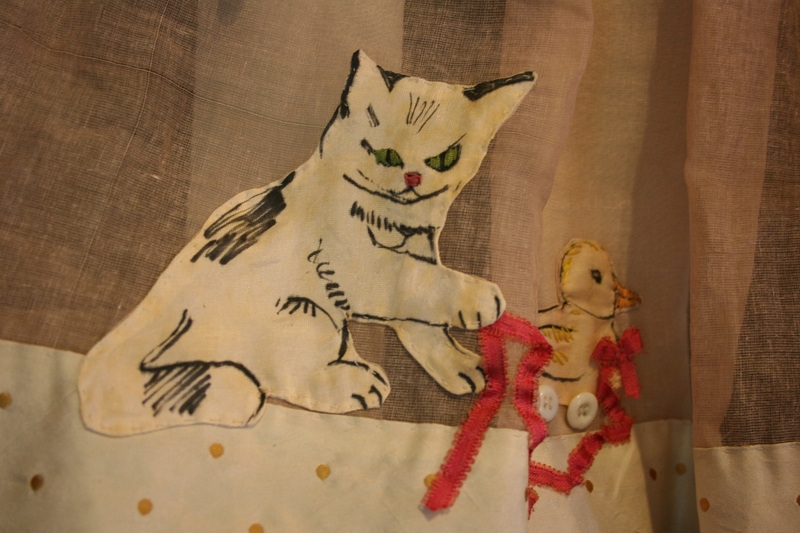 Playful vintage details incorporated into the child's dress. 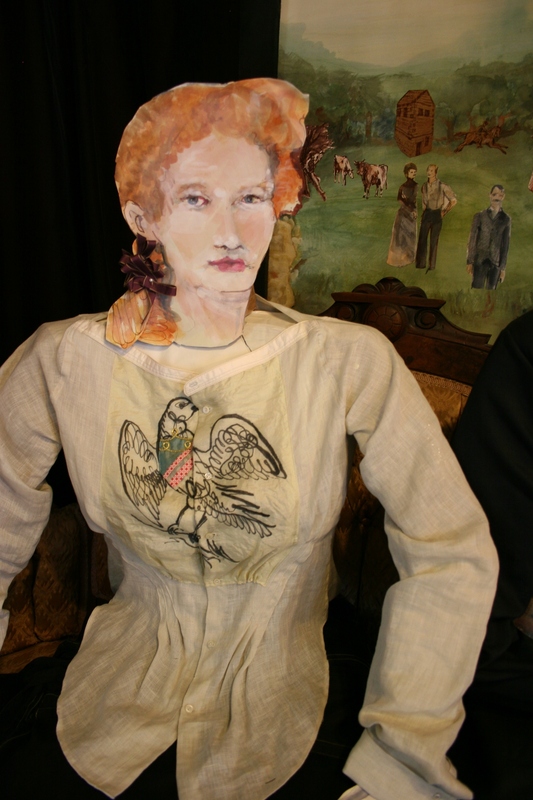 There's something almost sad, or perhaps contemplative, in the face of this woman painted by Lohrbach and wearing his original design. Lohrbach has created a piece worthy of study as much for the personal sense of history he conveys as for the detailed vintage-style garments he’s designed. “SOUVENIR PORTRAIT” will be on display at the Mantorville Art Guild, 508 Clay Street, until September 19. Gallery hours are from 11 a.m. – 4 p.m. Friday and Saturday and from noon until 4 p.m. on Sunday. Arrangements can be made for special tours. Fashionable attire is optional.